Travel in a Unique small Group of 12 or less! ''Exploring the depths of the Daintree Rainforest! '' Also check out our action packed Atherton Tablands Waterfalls Tour! 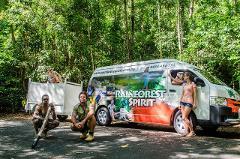 Our tours are designed to provide comfit and experience..
Rainforest Spirit Tours alos offers a Unique Waterfalls Tour! Discovering the Beautiful altitudes of the Atherton tableands! We travel to only the best places in the area. ''We don't rush! '' We spend more time at only the best places!